A little boy plays alone in a schoolyard while the rest of his classmates play in the distance – they are there, he is here. But soon a little girl joins the little boy, returning his paper airplane and making a new friend. I’m Here was created to reach out and appreciate those children in the autism spectrum, as well as anyone who is different. As a parent of a child with Asperger’s Syndrome, I was immediately drawn to this book. It is a truly lovely story that gives voice to a child who is unable to bridge the gap between himself and those around him; and encourages others to make that first connection. While the behaviour of the young boy in the story is reminiscent of Autism Spectrum Disorder, it is open enough that any child who feels shy or on the outer could relate. It also shows the importance of making the first move with kids who are shy or isolated and, maybe, make a new friend. There is a lot of subtlety to the story and it is wonderfully complemented with Peter H. Reynolds’ delicate illustrations. There is lots of white space on each page and this represented pictorially to me the tendency of many autistic and Asperger’s kids to shut out the world around them (I don’t know if this was the intention). 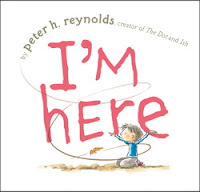 I’m Here would be a great book to read in a classroom setting as there would be so much for kids to learn, discuss and relate to. It is a beautiful book that I would certainly recommend. Peter H. Reynolds is an author and illustrator of children’s books and the Founder of the educational media company FableVision. He has illustrated Someday and Little Boy both written by Alison McGhee. He is also the creative mind behind the bestselling picture books The Dot and Ish.